Vertigo is a false sensation of movement that very often has a rotational element to it. Meniere’s disease is a vestibular condition that causes severe vertigo among other debilitating symptoms. 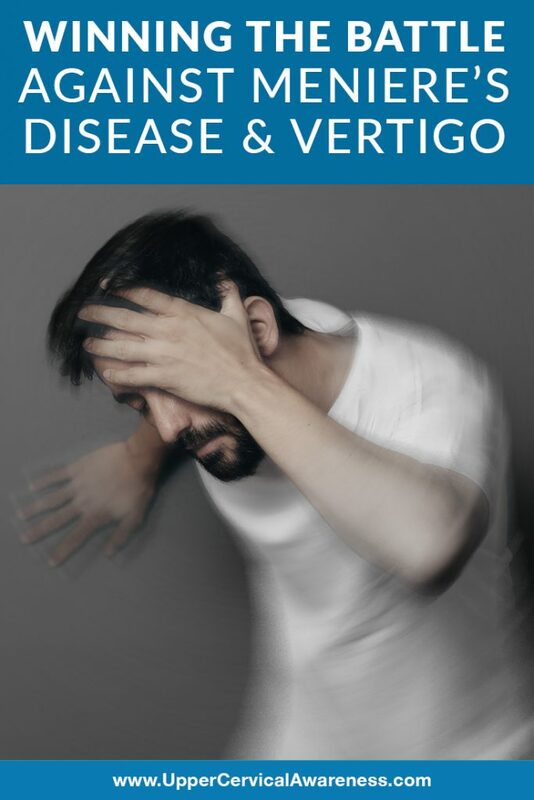 If you are suffering from this condition and vertigo is affecting your ability to carry out normal daily actives, what can you do? We’re about to address the secret to natural vertigo relief. But first, we need to discuss what may be at the heart of this mysterious syndrome. Meniere’s Disease: In the Ears or in the Neck? This may seem like a simple question. After all, Meniere’s is called a vestibular condition. The vestibular system is basically the inner ear and the vestibular nerve that sends signals about balance and spatial orientation to the brain (you may have also heard it called the eighth cranial nerve). So the issue must all be in the ear, right? That is certainly how most doctors treat the condition. You may be recommended a low salt diet to reduce fluid in the ears and may even be prescribed a water pill. However, Meniere’s and endolymphatic hydrops (an excess of fluid in the ear) are not the same thing. A Meniere’s patient may sometimes have endolymphatic hydrops, but not always. So what is causing the issue? One upper cervical chiropractor realized that many Meniere’s disease patients had misalignments of the C1 and C2, the top two bones of the spine that are located at the base of the skull. This makes sense because the atlas is positioned right between the ears. Even a slight misalignment can affect the Eustachian tubes. These are the tubes that are supposed to drain away that excess ear fluid so things like vertigo, tinnitus, and hearing loss do not occur. When the upper cervical chiropractor performed two case studies involving hundreds of Meniere’s patients who were simultaneously suffering from upper cervical misalignments, the results were astounding. 97% of the patients saw a significant improvement in their Meniere’s symptoms. In fact, vertigo was relieved by as much as 90%. The researcher posited that the upper cervical misalignment was responsible for gradually creating a lesion on the eustachian tube of the affected ear (most cases of Meniere’s only affect one ear). While more research is needed, this could be the breakthrough that Meniere’s researchers have been looking for over the past 150 years. A low-sodium diet is vital for a patient with certain cardiac issues, but it can lead to other problems for a person that doesn’t really need to be on this type of diet. Diuretics (water pill) can leave a person dehydrated, and that opens you up to all sorts of effects, including vertigo – one of the very things the pills are prescribed to treat, Finally, in severe cases, some doctors have recommended destructive surgeries that relieve some symptoms for the Meniere’s patient but could also result in permanent hearing loss. Some patients have been convinced to try these surgeries with the caveat that Meniere’s only affects one ear. However, some patients have undergone surgery only to find out that Meniere’s sets in for the other ear later on. While complications are not very common, they happen often enough to make it worth exhausting every natural therapy before opting for the invasive ones. Upper cervical chiropractic is emerging as a great natural alternative for all sorts of vertigo diseases, including Meniere’s. It is safe, gentle, and effective for nearly every patient who is suffering from vertigo along with an upper cervical misalignment. So how do you know if you have a misalignment in your C1 and C2? If you have ever had a head or neck injury, the chances are high that such a misalignment exists. It doesn’t have to be recent. In fact, in the case studies noted above, there was usually a 10 to 15-year gap between trauma and the onset of symptoms. These misalignments are very slight and take their time working under the surface. Other potential causes of upper cervical misalignments include: wear and tear due to poor posture, accidents, injuries, assaults, or even complications during birth. So don’t assume your C1 and C2 are properly aligned just because you don’t remember a specific injury. If you suspect that you may be suffering from an upper cervical misalignment, the best thing to do is see someone who specializes in these top bones of the neck – an upper cervical chiropractor. We use diagnostic imaging to precisely measure the C1 and C2. This allows each patient to receive a safe and gentle, customized adjustment that has been calculated specifically for you. There is never any jerking motion used. Just light pressure, the use of an adjusting instrument, or perhaps the help of a specialized chiropractic table, depending on the method of upper cervical care your practitioner prefers. If you are suffering from Meniere’s disease or any other vertigo condition, we encourage you to use the search feature on this site to locate a preferred doctor in your area. With only about 3,500 practitioners of this subspecialty around the world, you may need to drive a little bit to get your relief, but safe and natural care is worth the extra effort and time if it can keep you from invasive procedures and medication that is riddled with side effects. Schedule your consultation today to get started on the path to better overall health and wellness.